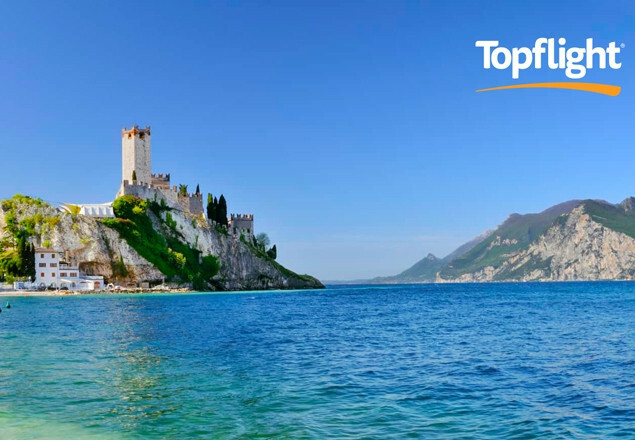 Rewarding Times are teaming up once again with Topflight, the Italian Specialist, to offer you an incredible holiday in the enchanting Malcesine, Lake Garda. Stay at the wonderful Hotel Majestic Palace for 7 nights from the 25th August 2018. Price includes flights, transfers, 20kg baggage allowance, half board accommodation in a deluxe bedroom, drinks with dinner and a buffet lunch 4 days of your weeks stay. Stay for 7 nights, half board, in a deluxe room at the 4 star Hotel Majestic Palace in Malcesine, with Topflight. Enchantingly beautiful with its quaint maze of narrow cobbled streets, its unspoilt harbour and of course breathtaking views across the lake, Malcesine lies at the foot of Mount Baldo, on the eastern shore of the captivating Lake Garda. Follow the romantic trail of narrow cobbled streets that meander their way through the town leading to a cute pebble beach. The harbour with its colourful boats bobbing by its walls, is surrounded by restaurants, cafés and shops allowing guests to sample a taste of ’la dolce vita’ as they sit, relax and people watch over a drink or two. Malcesine lends itself to a slower pace of life, where sauntering through the beautiful medieval town and relaxing by the waters edge is very much the order of the day. There are also plenty of day trips and excursions available in the area and with excellent ferry connections to other lakeside resorts, Malcesine is a great base for sightseeing and exploring all that Lake Garda has to offer. This modern hotel comes highly recommended due to its high standards of service, great leisure amenities and beautiful setting in the midst of a picturesque olive grove. There are fantastic facilities on offer here including four swimming pools, a tennis court, a gym, a playground, mini-golf and a volleyball court ensuring that no matter what your age, you’ll be far from bored here. The hotel’s buffet restaurant provides an array of superb Italian and international dishes for guests to try. There is huge variety and care and attention has been paid to ensure that all tastes are catered for. Drinks, such as beer, wine and soft drinks are included with dinner and a complimentary buffet lunch is served to guests four times a week. The modern deluxe rooms in this hotel are spacious, airy and bright and spotlessly clean. Each feature a private balcony and being at the foot of Monte Baldo as well as overlooking the lake itself, the views are truly spectacular. The Majestic Palace Hotel is also an excellent starting point for exploring the area and its undeniable beauty. Malcesine itself is stunningly gorgeous and there are boat trips to other neighbouring towns that would be a shame to miss out on. Verona: 1 hour, 30 minutes approximately. Price is based on 2 adults sharing, with a stay for 7 nights in the 4 star Majestic Palace, Malcesine on a half board basis. This holiday must be taken on the selected date of 25th August 2018 and is subject to availability. There are 5 rooms available on each date for this offer. Offer includes return flights from Dublin or Cork to Verona, return transfers, 20kg baggage allowance, 7 nights accommodation in the 4 star Majestic Palace Hotel on a half board basis, in a deluxe room, all taxes and a rep service in resort. Once you have received your voucher, please contact Topflight Holidays with your voucher number, name and address, no later than 15th August 2018. Holiday must be booked with Topflight Holidays, Jervis House, Jervis Street, Dublin 1. Topflight Holidays booking terms and conditions apply.